August 16th, 2018 | Category: Baseball,nba,Ronald Acuña Jr.
Portland Trail Blazers guard C.J. McCullum complained in an interview a few weeks ago about star players joining superteams (specifically Kevin Durant going to the Golden State Warriors) saying, “I would never do anything of that nature. I think that it’s disgusting. No. It’s disgusting. I’m not built like those guys. I was raised differently … I think some players will take that route. But most guys have too much pride, want to really win on their own.” The video of his interview recently resurfaced and Twitter reacted. Social media really took off when “Jennifer” tweeted to McCullum, “Win a playoff game then talk”. McCullum responded with, “I’m trying Jennifer”. 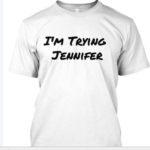 “I’m trying Jennifer” is now trending as a meme, and some fans have made t-shirts hoping this phrase becomes the Blazers team slogan!